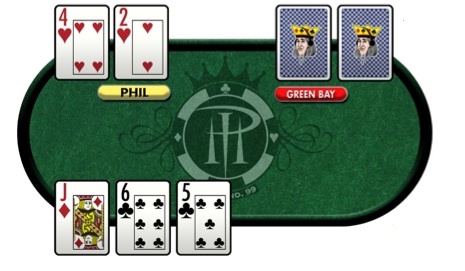 Hand of the Week: Play the Player! 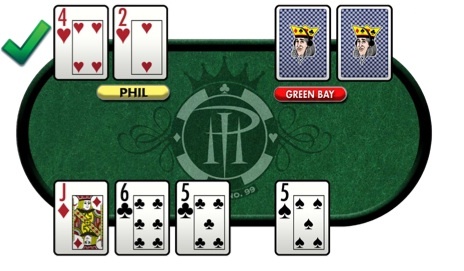 On day two of the World Series of Poker’s Main Event in 2008, I found myself bluffed out of a huge hand by a fellow player from my home state of Wisconsin. I was more than a little steamed because the young Wisconsinite – who I will call “Green Bay” because he had dressed the part in a Green Bay Packers sweatshirt, my favorite NFL team – just couldn’t resist the urge to flip his cards after I folded to rub it in: a stone cold bluff. Look, he made a good play, but it’s always war at the poker table, right? Getting personal in these things is never a good idea, but sometimes I can’t help myself. I studied Green Bay for the next five hours. Every time he entered a pot, I paid attention to the hand he flipped over. Was he strong or weak? When he raised pre-flop, what kind of cards was he holding? What were his tells? I also noticed that he handled his chips a bit differently when he was strong as opposed to weak. It was an unscientific observation, but I caught it a few times and it became my tool. Finally, I found the opportunity to use that tool against him. 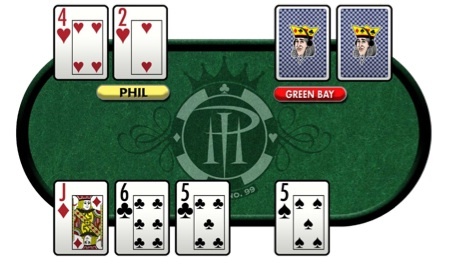 Here was the hand: I was holding the 4h-2h – with the blinds at $400/$800 – and I decided to make my move. Green Bay opened for $2,400. From the small blind, I called the $2,400 and raised it another $5,000. Green Bay called. The flop was Jd-6c-5c, and what do you think I did? I bluffed out $7,000. Green Bay made it $20,000 to go, and the pot was over. Right? I mean, what could I do? I couldn’t move all-in and risk my whole tournament, could I? What if I was wrong? The obvious choice was to fold my hand right there and then, but somehow folding just didn’t seem right to me. I reasoned that I probably would have just called the $13,000 raise on the flop had I had pocket kings, so I decided to take the bluff one more step and represent that that was exactly what I was holding. Pocket Kings. I called the $13,000 and, when the 5s hit on the turn, I bet out $12,000. Now Green Bay looked shaken. Was he upset because on some level he knew that I was on a bluff – a bluff, in fact, that no player could reasonably carry on this far? Was he upset because he knew on some level that he had to fold the best hand? Now the ESPN cameras appeared, and I smelled a new line in the making. When Green Bay folded his hand, I almost folded my hand face down. But I couldn’t resist showing him – and the world – a big stone-cold bluff, so I asked my audience that had gathered around, “Do you want to see my hand?” Of course, they all begged to see it. “I called the $13,000 raise to bluff you on the turn and show you who I really am,” I answered. Here’s the best part: Green Bay later told me that he had been holding pocket 10s!